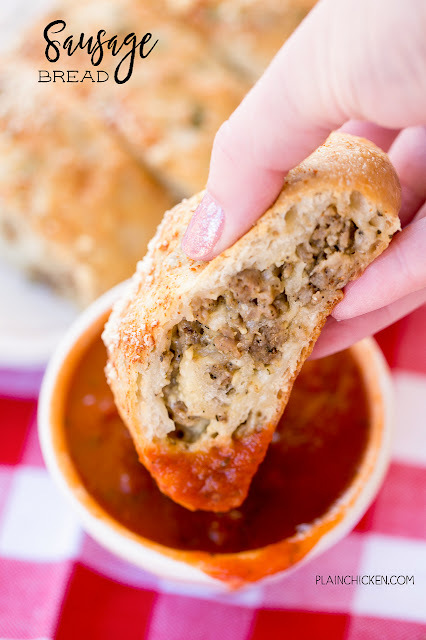 Sausage Bread - SO good! We ate this for lunch two days in a row! Easy and delicious! Great for parties and an easy lunch/dinner. Serve with warm sauce. Refrigerated french bread dough stuffed with sausage, onion, fennel, dijon mustard, egg, mozzarella cheese, butter, Italian seasoning and parmesan. Can make ahead of time and reheat. Are you ready for the BIG GAME on Sunday?!?!?! I can't believe football season is over! I'm so sad!! I am going to have to drown my sorrows in tons of great football food during the Super Bowl. Good thing football food is my favorite. I've been working hard on my menu. 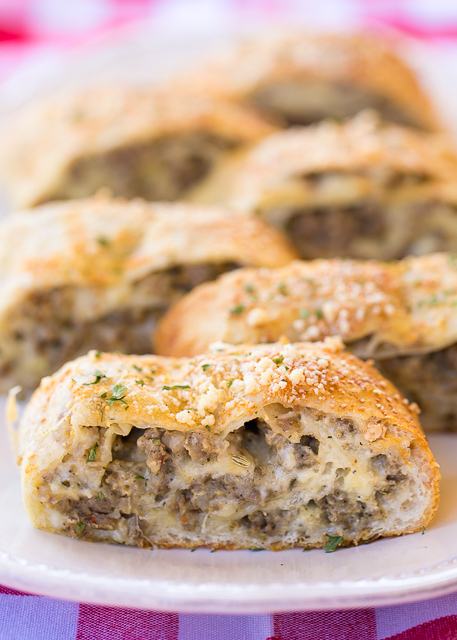 One thing that I know will be on the menu is this amazing Sausage Bread! OMG! SO good!!!! So simple yet so delicious. We ate this for lunch last week and loved it. I served the bread with some warm pizza sauce. Perfection! This Sausage Bread was even good reheated for lunch the next day. You could make this ahead of time and reheat it for the game. I would bake it and then reheat it in the microwave or oven. I find that the refrigerated doughs don't bake and rise as well after they have been opened and refrigerated. Heat oven to 350°F. Spray cookie sheet with nonstick cooking spray or line with parchment paper. In a skillet over medium-high heat, cook sausage until no longer pink. Drain. In a bowl, combine cooked sausage, mozzarella cheese, egg, mustard, onion powder, fennel seeds, salt, pepper, and 1/2 tsp of Italian seasoning. Unroll dough. Spread sausage mixture over dough. Starting with long side, roll up dough; press edges to seal. Make 3 to 4 slits in top of loaf. Place on prepared cookie sheet. Combine remaining melted butter, Italian seasoning and garlic. Brush on top of bread loaf. Bake for 25 to 28 minutes or until golden brown. Cool 5 minutes. Cut into 1-inch diagonal slices. She says what to do with it in the recipe - Combine remaining melted butter, Italian seasoning and garlic. Brush on top of bread loaf. Could you possibly use Pillsbury Crescent Sheets? This was awesome. Big hit with everyone. I only had spicy mustard instead of Dijon, and it was a bit strong. I might dial that back a bit. But will be making again!!! I've made this twice and really, really enjoy it BUT I do have one question/problem. I had never purchased the french bread dough before and expected to be able to easily "roll out the dough" like crescent roll dough but it doesn't seem to have any perforations. Am I missing something? lol It tasted good but I made such a mess of my dough that it wasn't very attractive and, more importantly, there wasn't enough room to use all of the filling. I still sauteed the filling to get the egg cooked and ate it on toasted english muffins but the french bread is SO good with it that I would like to make it as you describe. Any hints?